We've all heard plenty about what the internet is doing, and will do, to traditional advertising. So what about advertising research? There are already a multitude of ways to track your brand online. I pulled a Blogpulse chart for a post in this blog a few weeks ago and there's no reason you can't do the same for any brand. And that's just scratching the surface of what's on offer. Alongside all the new toys are a few things that would make me worry if I was involved in traditional brand tracking - measuring how many people are aware of a brand, or remember its ads, that sort of thing. Facebook has decided to become a pollster because it can't make enough money from selling advertising space. 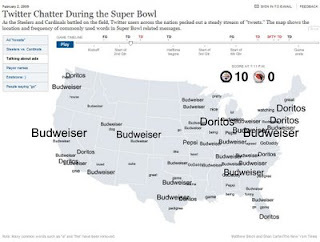 This wonderful timeline of what ads people were twittering about during the Superbowl is easy enough to reproduce if you can code for the (free, in limited form) Twitter API. Silobreaker has planted itself firmly in the PR tracking space and even Google Trends is a great indicator of the interest a brand is generating. If you pick the terms carefully it can be a quick and easy ad awareness calculator. A great deal of information about how people are interacting with your brand is becoming available online, either very cheaply or for free. You wouldn't dump brand tracking yet, but it's going to have to start working harder. So ad awareness doubled last month? I can find that out for free from Google, what else have you got?